Weather: Windy, drizzle, clag on plateau. 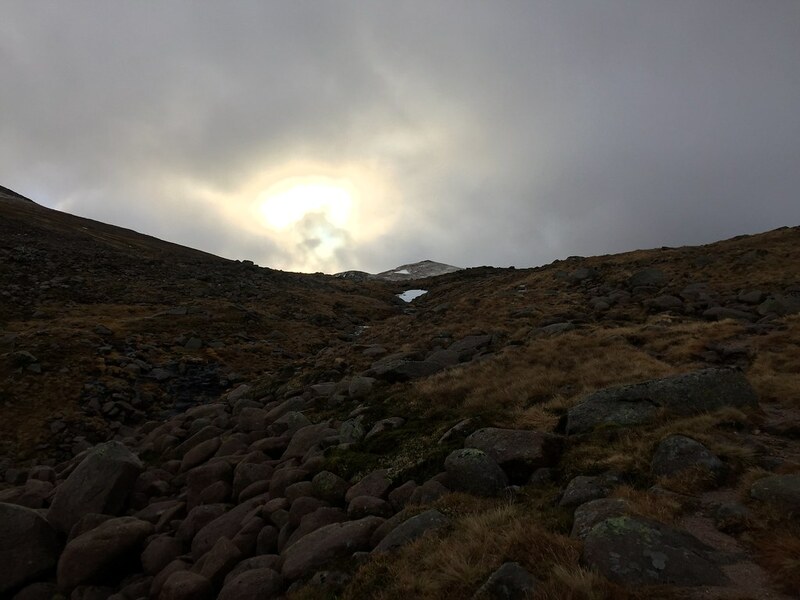 A late decision to head to the hills with David (Rounsfell) wasn't assisted by a particularly inspiring weather forecast. Having wussed out of a potential bothy stay on the Friday evening, our plan A was now to head out to Beinn Mheadhoin from the Ski Centre carpark. Driving down to Aviemore in the dark and rain really didn't motivate me to want to get out of the car, but on arrival, the rain had stopped and things looked a bit better. David had stayed overnight in his van at the Sugarbowl carpark, and we were very quickly on our way. 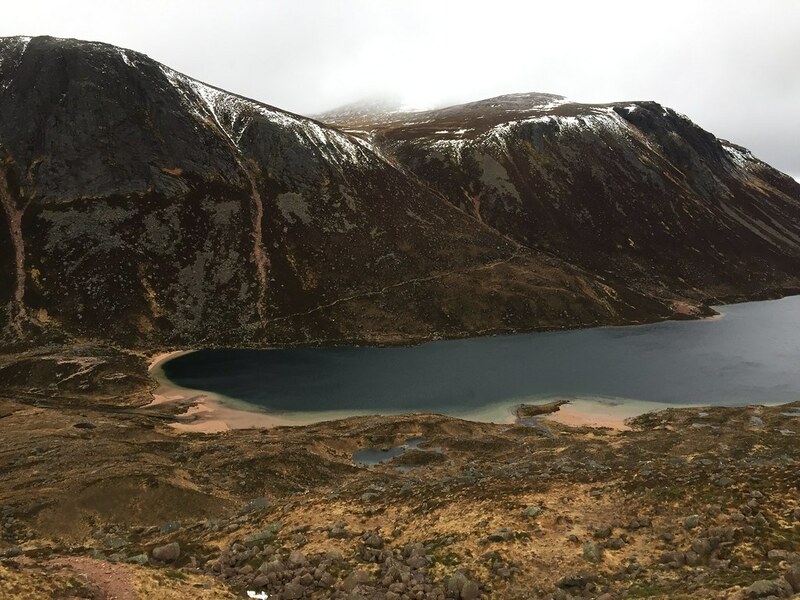 We walked up through Coire Cas and broke out onto the Fiacaill by the well-made path - no need for scenic detours today as it wasn't going to be overly pleasant higher up! 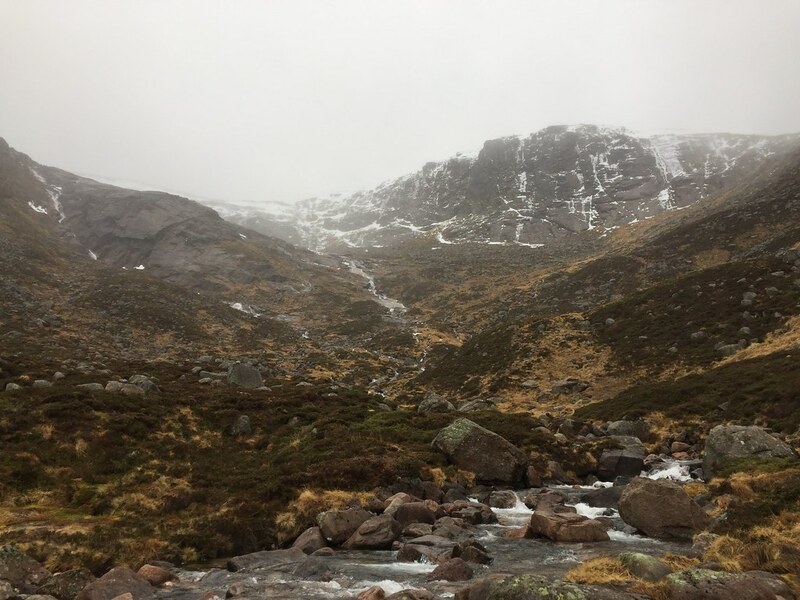 There was almost no snow in the corrie - with the funicular also off, it didn't really seem like winter at all. 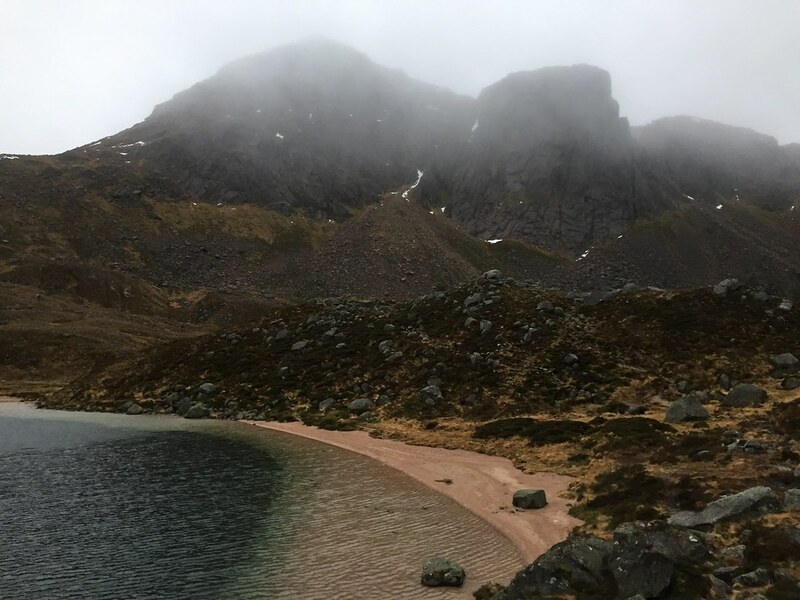 At least on the drop down Coire Raibeart to Loch Avon, the scenery improved, and it looked like we would be largely out of the clag for the day. 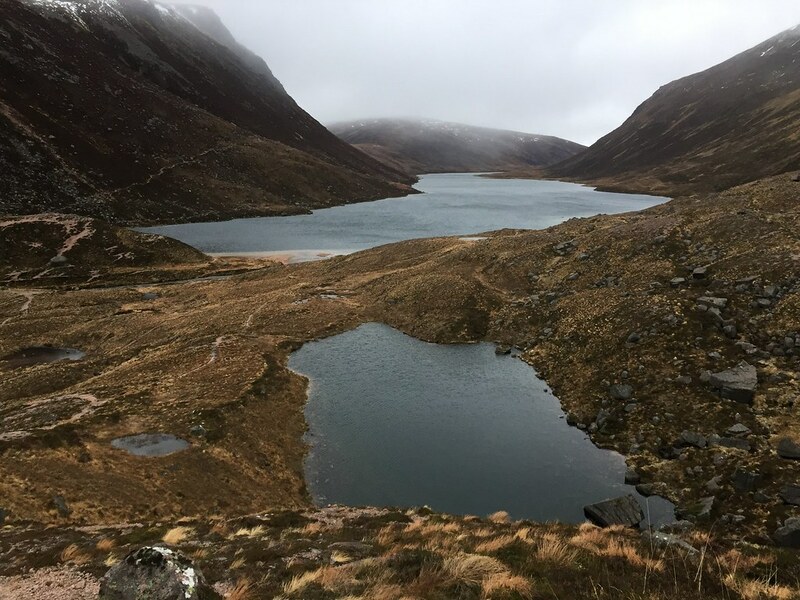 The head of Loch Avon still looked pretty striking today despite the greyness, and I was glad to be out. 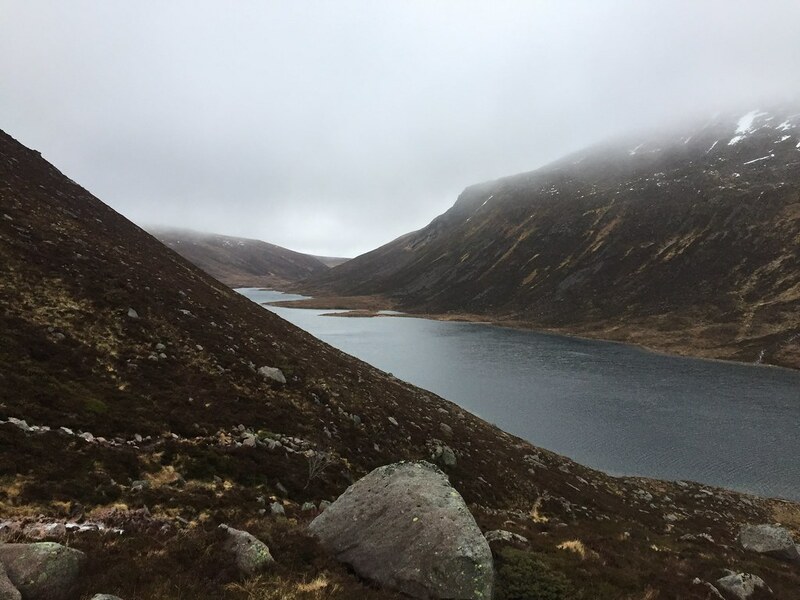 After a quick stop at the beach for a snack and drink, we crossed the burn and climbed up towards Loch Etchachan. 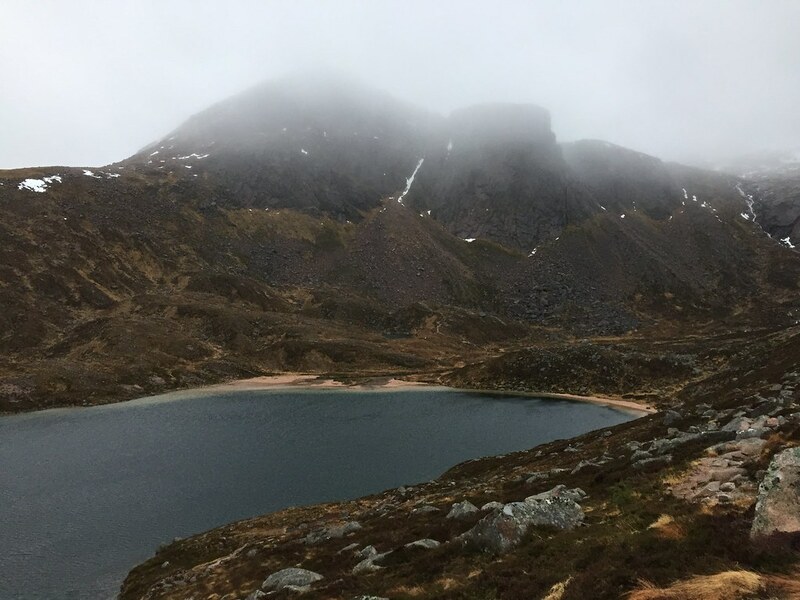 As Beinn Mheadhoin itself looked as if it might end up in the clag, we detoured via Stacan Dubha for a view or two (little did Rounsfell know this would be the only summit he would be bagging today!). 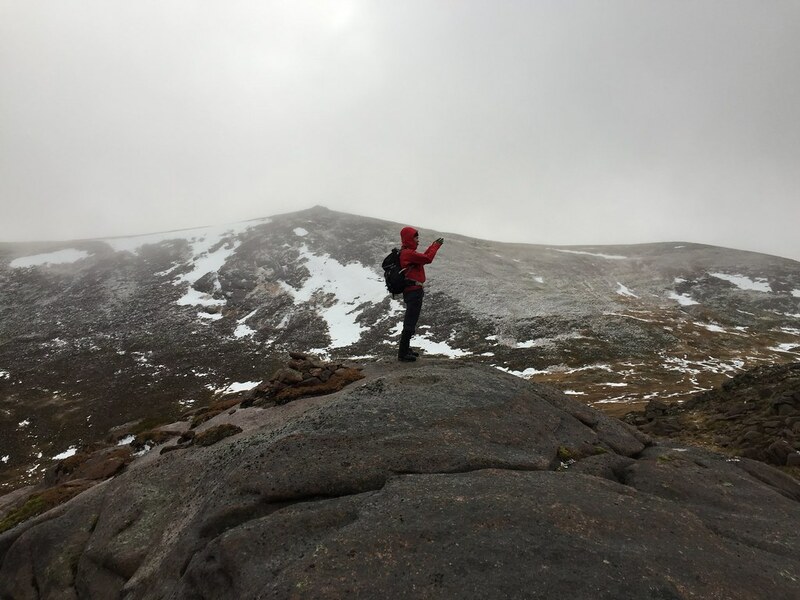 This is a favourite Cairngorm summit of mine, and a memorable camping spot back in July. From here we traversed up onto the Beinn Mheadhoin plateau, taking the slightly more bouldery route to stay off the highest ground for as long as possible. As predicted, the wind on the plateau was unpleasant, but not unwalkable...until we reached the summit tor, that is! Walking between the main and subsidiary tors, we were buffeted in all directions. We found a sheltered spot to stop for a break before making an attempt on the summit. What is normally an easy ascent was rendered completely impossible by the thin film of ice on the surface. I had left my crampons behind due to the almost complete lack of snow, but Rounsfell had brought his microspikes along. As it turned out, it would take more than just microspikes to get onto the tor, especially with the wind howling on the top. It would also take massive balls! After sliding rather rapidly back down from a point halfway up, Rounsfell gave up, and I didn't really fancy an attempt either . 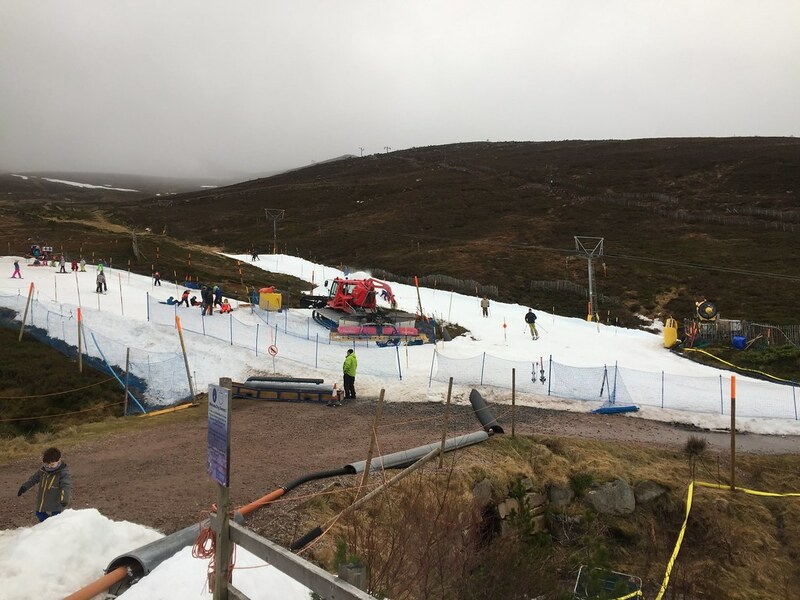 Slightly frustrating to be turned back by ice at the last bit given the pitiful amount of white stuff overall in the Cairngorms this weekend, but that's life! 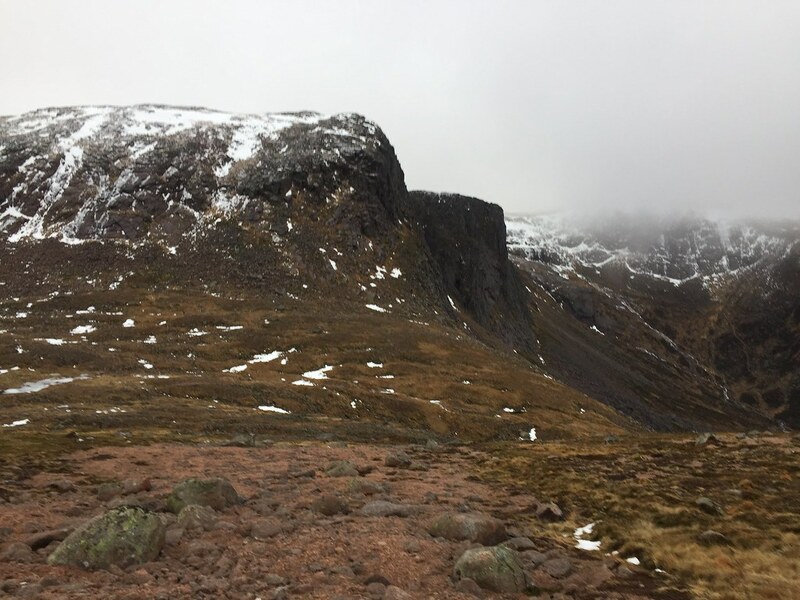 We stuck to the plateau slightly longer on the way back in order to avoid the icy rocks we had ascended over - this didn't take long, but was thoroughly unpleasant, especially when I found my boot lace had come undone. Freezing fingers to fix that. Soon enough we were descending easy grassy slopes back towards the Loch Avon path - the weather had closed in a little, and didn't really inspire a visit to Loch Etchachan or an alternative return route over the plateau. 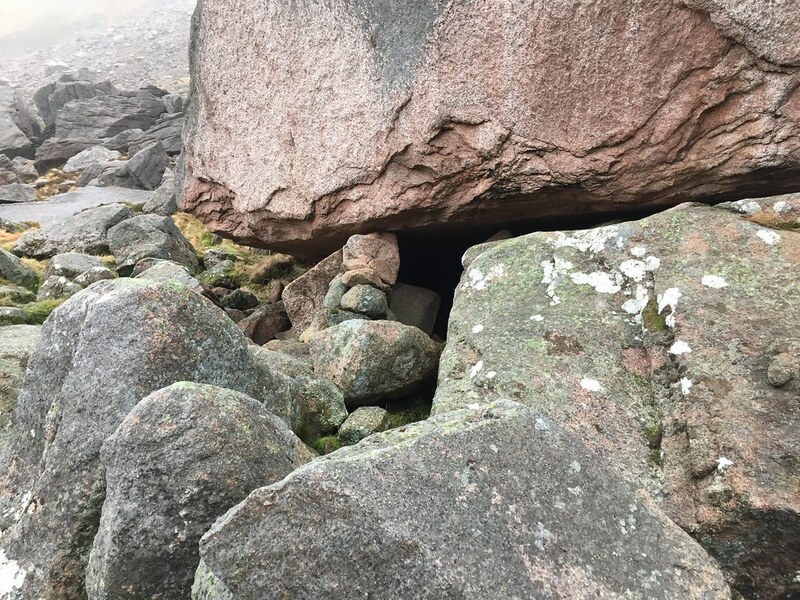 Back down at the head of Loch Avon, we took a short diversion to look at the Shelterstone - it was only then that I realised that I hadn't been there before. Last time I had visited a howff in this area, it was one of the smaller pretenders. Can't say I'd be in a rush to stay there, but it was a bit more sheltered than I had thought. 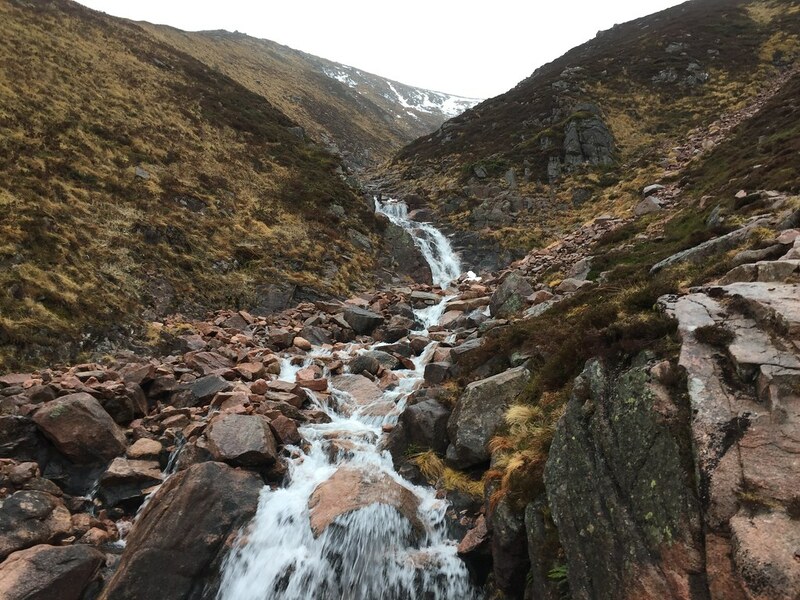 Then it was across the burn (no slips or trips, much to my disappointment ) and back up the Coire Raibeart path. 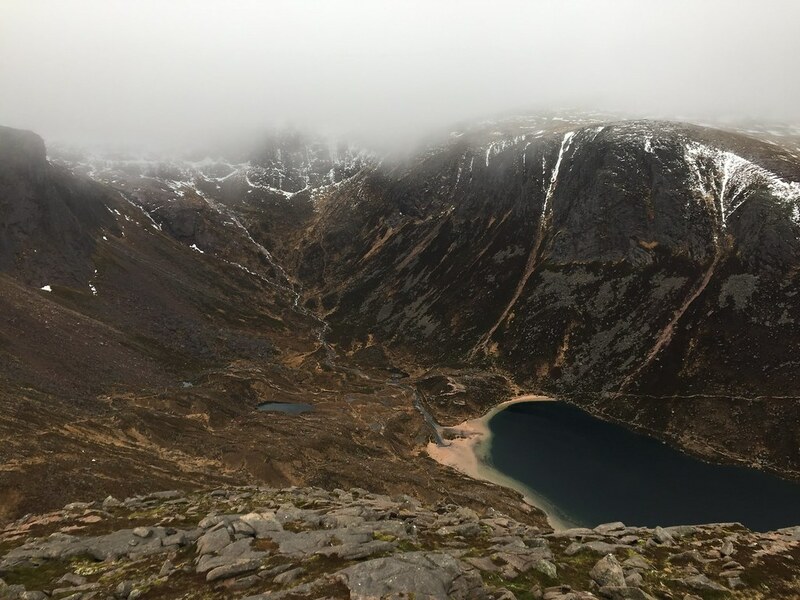 The shallow top part of the corrie seemed to drag on a bit, and the wind was unpleasant high up, but it wasn't that long before we were dropping down the Fiacaill Coire Cas back to the car. We hadn't really hung around today, and were only out for 6 hours, but it was plenty enough in the conditions! Once back, we decided that coffee and a cake would be a good move before heading off. Nice trip Malcy and quick too. 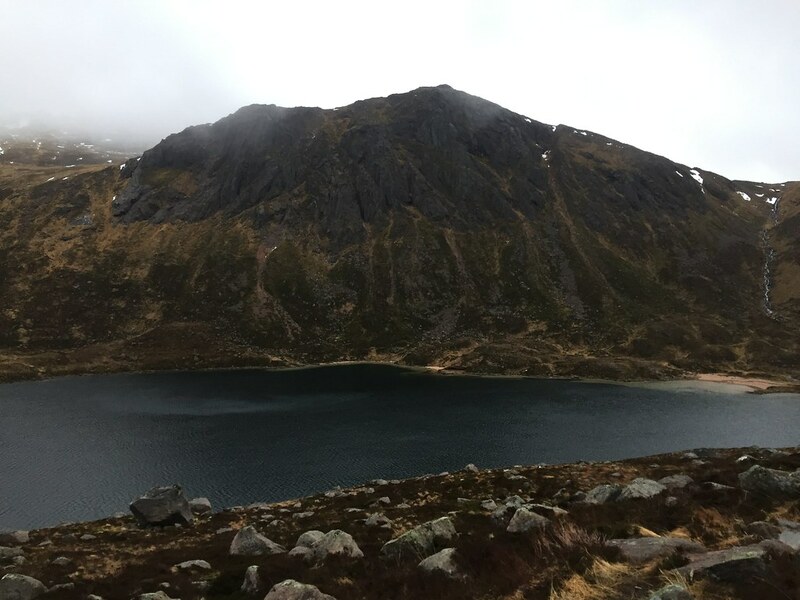 A fine summit and a lot of descent and reascent to do it from the Aviemore end but a great route down past Loch Avon. That's definately the real Shelterstone you have got there - can tell by the red black V patterns. I've seen a few photos in reports claiming a different stone which is much smaller and right beside the path. An easy mistake though because it is a good, if much smaller howff. I made the same mistake myself on my first visit. A wise old man with a beard appeared (could have been Caberfeidh ) and asked me if I was looking for the Shelter stone to which I replied "is this not it?" The old guy kept me right and gave me a guided tour to the correct stone and told me some of its history. Great area, mildly annoying not to make the top of the tor but a pretty good decision by the sounds of it. I think you made a VERY good call not to go on the thin ice around Mheadoin summit. The last time I did anything like that I ended up slipping dramatically and tearing my left shoulder rotator cuff, the op for which I had in August last year, and I'm still 6 months away from being fully healed . I do envy your proximity t't hills. Once my son moves up to Scotland I hope to spend a lot more time up there (he has promised there'll be a room for me in his house ). 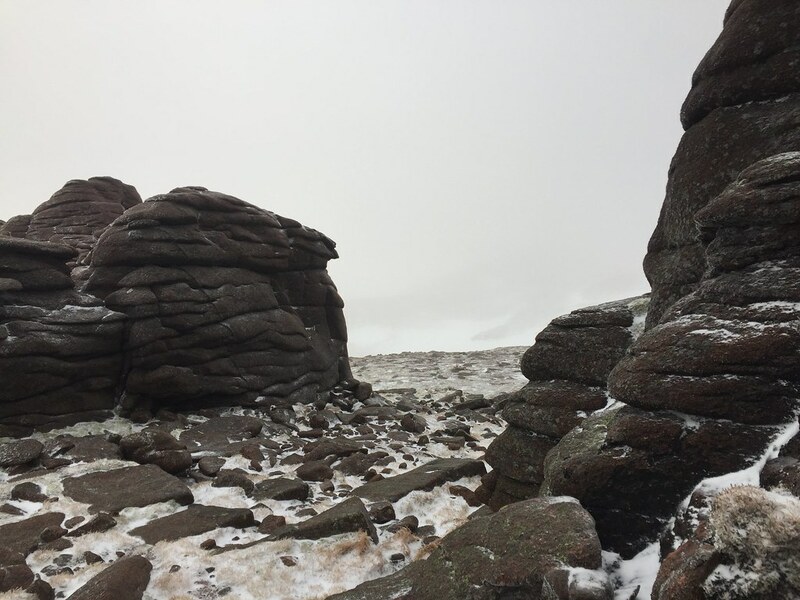 Nice report and photos - having just come back from Cairngorm last night, it is like another planet compared to the browns and golds you had - all plastered in white (for as long as it lasts! ).